For a long time, I didn't think it was worth spending more than an hour on a beach, even the most beautiful ones, unless there were some nice cliffs nearby showing some interesting geology. My views in this regard have changed dramatically about three years ago, when I spent a week on The Big Island of Hawaii, and the hotel where we were staying offered free rental of snorkeling gear. I put on the mask and the fins, trying to remember how this was supposed to work (I did a bit of snorkeling in Baja California many years before that), and put my face into the not-too-interesting-looking waters in the front of the hotel. Three years later I went back to the Big Island with more excitement about tropical beaches, plus bigger plans and a bit more knowledge about snorkeling. After going through a few well-known snorkeling sites on the west coast, like Kahalu'u Beach in Kona and Two Step near Pu'uhonua o Honaunau park, we got on a nice boat (run by a company called Fair Wind - strongly recommended!) 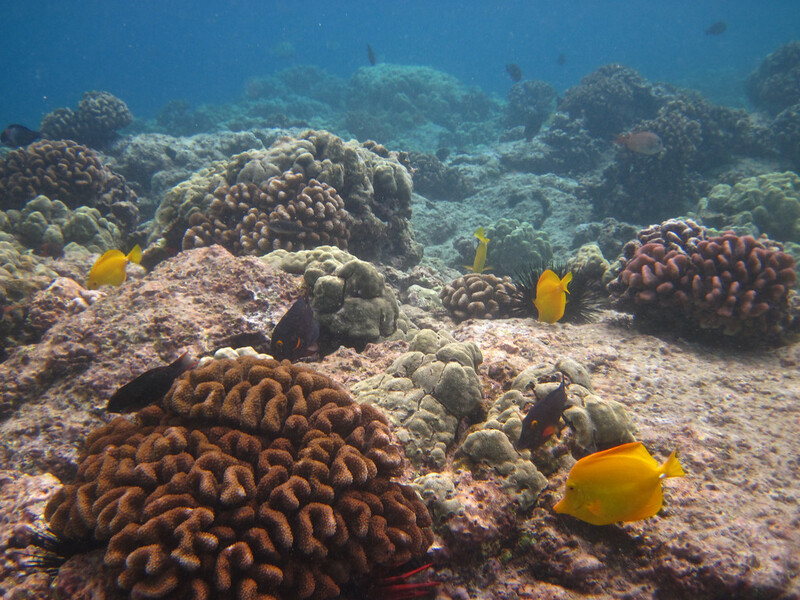 and did some snorkeling in Kealakekua Bay. Kealakekua Bay is difficult to reach; there is no road and no parking lot nearby. You either have to hike in, paddle through the bay in a kayak, or take a boat. I have heard before that this was the best snorkeling spot in Hawai'i, but I think that is an understatement. 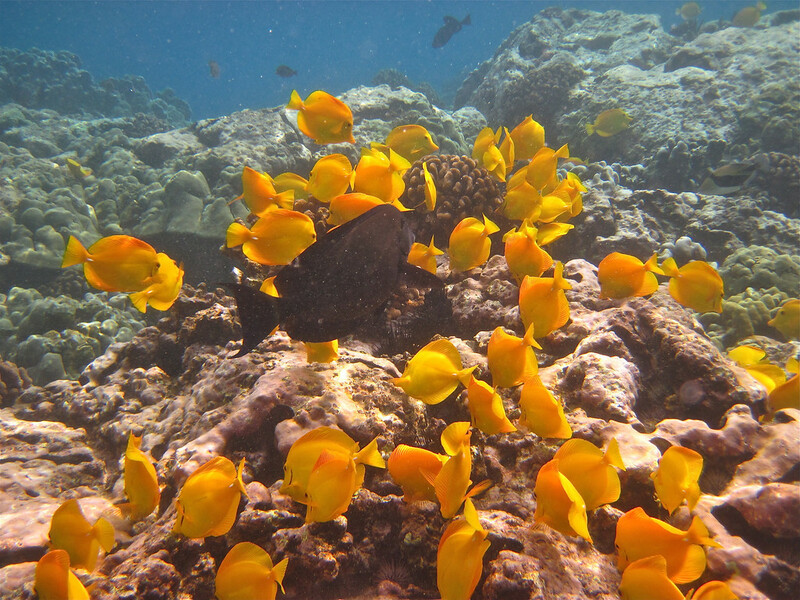 Unlike all the other spots we tried during the last few years in Hawaii (and that includes several beaches on Kauai and Hanauma Bay on Oahu, the presidential snorkeling site), the water at Kealakekua Bay was calm and very clear, with fantastic visibility. When I was at Kealakekua Bay, I didn't know much about the local geology. The big cliff bordering the bay toward the northwest, called Pali Kapu o Keoua (see image above), shows a number of layered lava flows that belong to the western flank of Mauna Loa; and I suspected that this must have been a large fault scarp, but that was the end of my geological insight. A couple of hours worth of research after I got home revealed that Pali Kapu o Keoua was a fault indeed: it is called the Kealakekua Fault and it has been mapped, along with the associated submarine geomorphological features, in the 1970s and 1980s by U.S. Geological Survey geoscientists. It turns out that one of the shipboard scientists and key contributors to these studies was Bill Normark (see also a post about Bill at Clastic Detritus). While in California in the late 1990s, I was lucky to get to know Bill and have some truly inspiring discussions with him about turbidites, geology, and wine, so this was a doubly valuable little discovery to me. 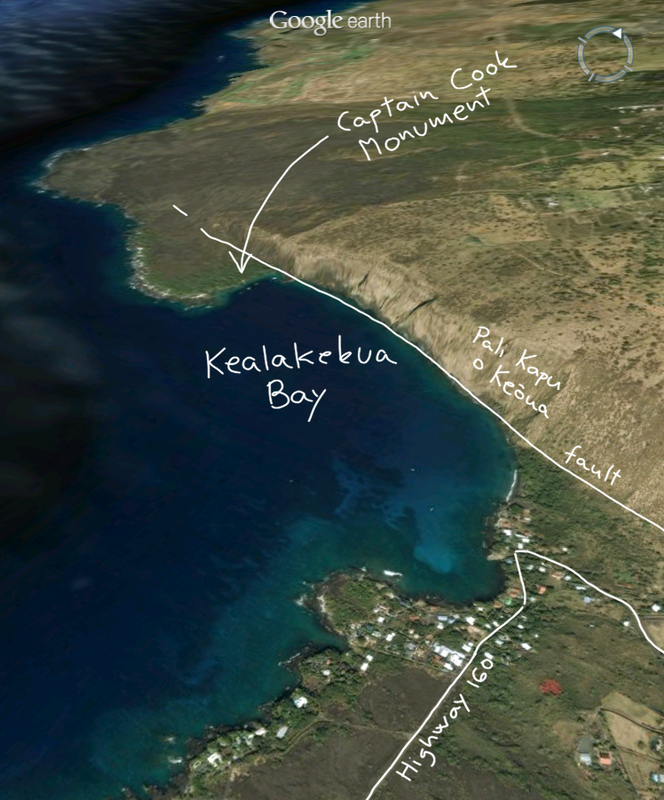 So what is the origin of the Kealakekua Fault? 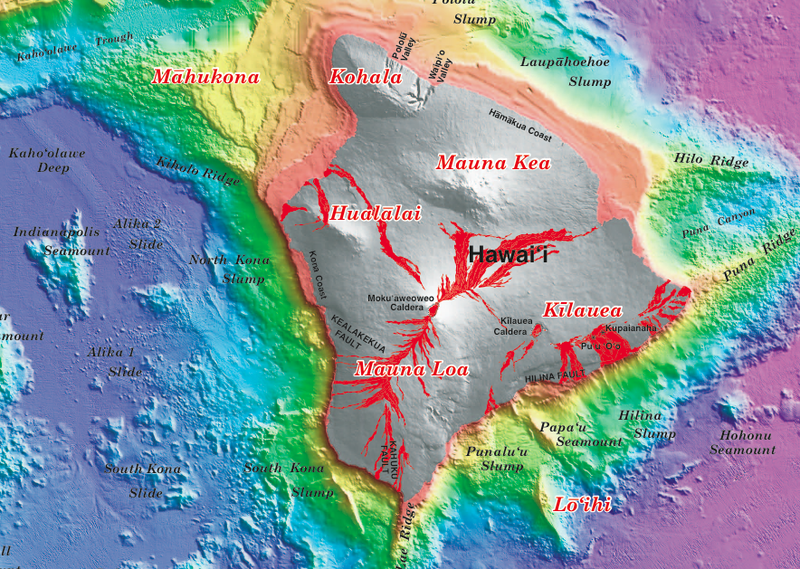 The Hawaiian Islands are far away from any tectonic plate boundaries, so there is not a lot of opportunity here for inverse or strike-slip faults to develop. However, the Hawaiian volcanoes are humongous mountains and their underwater slopes are extremely steep by submarine slope standards: gradients of 15-10˚ are common. [This is in contrast by the way with the relatively gentle slopes of 3-8˚ the subaerial flanks of the volcanoes, a difference that - it just occurred to me - has to do something with the different thermal conductivities of water and air. Water is ~24 times more efficient at cooling lavas, or anything for that matter, than air, so once a volcano sticks its head out of the water, basaltic lava flows are pretty efficient at carrying volcanic material far away from the crater, thus building gently sloping shield volcanoes. The same flows are promptly solidified and stopped by the cool ocean waters as soon as they reach the coast.] Slopes that are this steep are also unstable; the underwater parts of these volcanoes tend to fail from time to time and large volumes of rock rapidly move to deeper waters as giant submarine landslides. 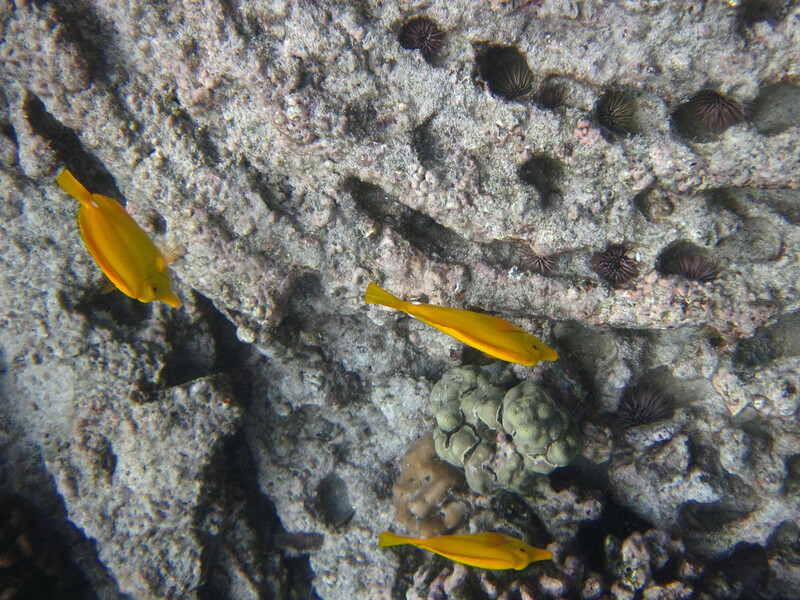 Seafloor mapping around the islands revealed that the underwater topography is far from smooth; instead, in many places it consists of huge slide and slump blocks. Kealakekua Fault is probably part of the head scarp of one such giant landslide, called the Alika landslide. This explains the steep slopes in the bay itself: after a narrow wave-cut platform, a spectacular wall covered with coral - the continuation of the cliff that you can see onshore - dives into the deep blue of the ocean as you float away from the shore. In contrast with submarine landslides that involve well stratified sediments failing along bedding surfaces and forming relatively thin but extensive slide deposits, the Hawaiian failures affect thick stacks of poorly layered volcanic rock and, as a result, both their volumes and morphologic relief are larger (see the paper by Lipman et al, 1988). The entire volume of the Alika slide is estimated to be 1500-2000 cubic kilometers. That is about a hundred times larger than all the sediment carried by the world's rivers to the ocean in one year! The slides have moved at highway speeds and generated tsunamis. There is evidence on Lanai island for a wave that carried marine debris to 325 meters above sea level; this tsunami was likely put in motion by the Alika landslide*. 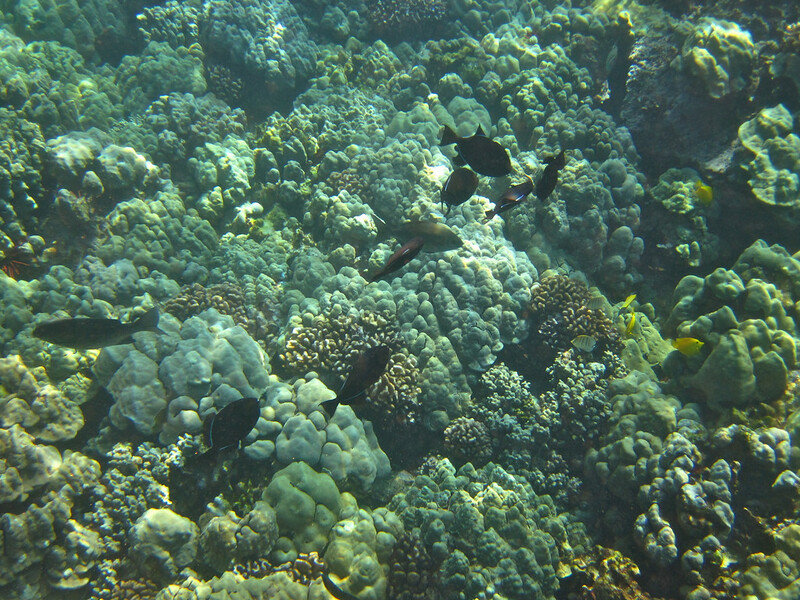 You don't want to be snorkeling in Kealakekua Bay when something like that happens. And it will happen again, it is a matter of (geological) time. Giant underwater landslides are part of the normal life of these mid-ocean, hotspot-related volcanoes.